Making your pop up camper mattresses more comfortable may seem like an impossible task, I promise you, it can be done! We have made a few little modifications that have us sleeping like babies all night long. If you have seen the “after” pictures of our pop up camper remodel, you know that I am more of a glamper than an actual camper. 😉 I love to experience the great outdoors, but at the end of the day, I want to come home to a comfortable bed with a fluffy comforter. It drives Mr. TypeTwoFun a little crazy, but that’s just how I am. In fact, before we got the pop up camper, our tent setup included air mattresses with memory foam and down comforters. No, really, it’s true! We laugh about it now, but this set up is probably the reason we decided to take the plunge and buy a camper. While it may be a little over the top, I think it’s safe to say that I know how to sleep in comfort when camping. So when we bought our Santa Fe, I knew those stock mattresses were not going to cut it. We have a memory foam mattress at home, and I love it. I wanted to bring that comfort to our little PUP by adding a memory foam topper. I wasn’t sure just how thick my topper could be without interfering with the roof closing. As luck would have it, we had an extra 2″ queen sized memory foam topper sitting around. We placed the topper on one of the bunkend beds and closed the camper up. We had no problem whatsoever closing the latches, so we figured that 2″ was a perfect thickness for our trailer. If you don’t happen to have an extra topper hanging around your house, the Kleenex Box Test (another great idea we found on the Pop Up Portal) is a great way to find out just how much room you have left between your mattress and your camper roof when the camper is all popped down. The idea is to place an empty tissue box on your mattress and then fold the camper up as you usually would. 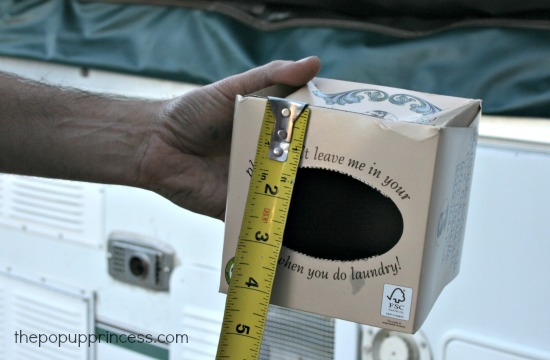 When you open up the camper, take out the tissue box and measure the height. That should be the amount of room you have left for things like mattress toppers. We decided to give the Kleenex Box Test a go, just for curiosity’s sake. 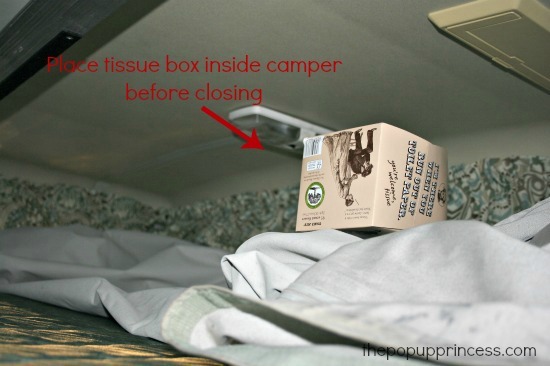 We placed a tissue box on the mattress just before closing up the camper. We decided to place it on top of the folded up canvas towards the edge of the roof, to make sure we’d get an accurate result. Then we closed up the camper fully and fastened the roof latches. 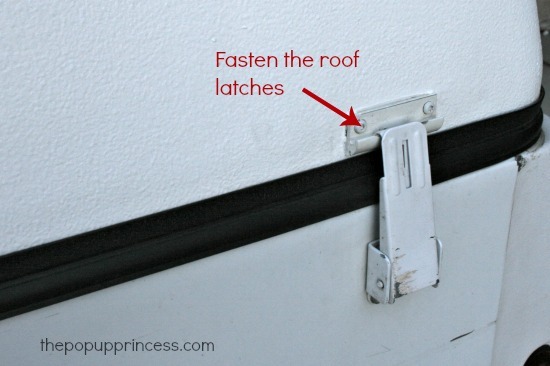 You want to make sure your camper is completely closed and latched. Then open the camper up again and measure the tissue box. Our tissue box hit the camper door handle the first time, and it barely made a dent in the box. We decided to move the tissue box around several times and take measurements each time. It actually was pretty consistent each time. We measured our box after all our tests, and it seemed like we had at least 4″ of room between our mattresses and our roof. It makes sense, really, because we were able to add the 2″ memory foam topper and had no problem closing the roof with it on. Once we started leaving the bedding and the curtains on, though, it got a little tight. If you leave your curtains, bedding, and solar bunkend covers on when you close the camper, you’ll want to make sure you leave them on for the Kleenex Box Test, too. Because we only had one 2″ memory foam topper, we had to purchase two more — one for the dining table bed and one for the master king bed. I researched memory foam for a few days, and I finally ended up purchasing these toppers from Amazon. Four years later, I’m still really happy with them. I bought one full sized and one king sized topper. The toppers were a little big, so I just took an electric knife and trimmed them to fit our existing mattresses. It was easy, and now we have memory foam toppers that fit each bed perfectly. To protect the memory foam when we close up the camper, I decided to buy some cheap mattress protectors from Ikea. These particular ones happened to be on clearance, and I got a full sized protector for $4! Because they didn’t have king sized protectors, I bought two twin sized ones ($2/each) and snipped the elastic off one side of each of them. Then I sewed them together down the middle to make a king sized protector. It fits perfectly! 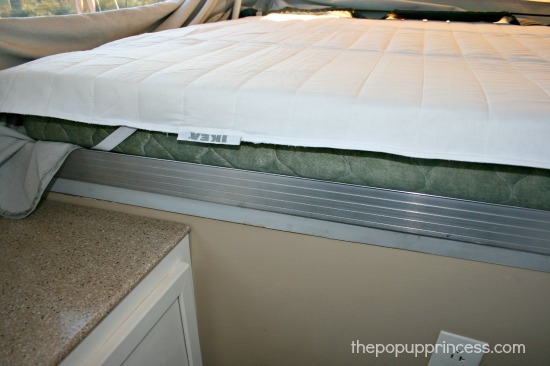 The mattress pads protect the memory foam when the camper is all folded down, but they also add an extra layer of comfort. Depending on how much room you have, you could probably go with a thicker pad for an even cozier sleep. I’m still debating with Mr. TypeTwoFun about adding a bit more padding. It took approximately 12 tiles (3 1/3 across x 3 1/3 down) to line the king side and about nine tiles (2 1/3 across x 3 1/3 down) to line the full side. You can simply cut the foam to size with a utility knife and a straight edge. We much preferred the thickness, texture, and smell of the Costco tiles. The Harbor Freight tiles were a little more difficult to cut to size, and they smelled awful for days. The Costco tiles were also a MUCH better deal. Each package cost us $10, but the Costco package came with eight tiles, and the Harbor Freight only had four. Overall, it was a quick and easy project, and it added quite a bit of comfort. When we make our beds, we use a fitted sheet in the actual size of the camper bed and a flat sheet one size down. So for our king bed, we use a king fitted sheet and a queen flat sheet. All the blankets and comforters we use on the bed are in the same size as the flat sheet we use. Because there isn’t a thick mattress and boxspring on a bunkend bed, I don’t need the extra drop I’d get from a king sized comforter. Using a queen sized one prevents major overhang on the sides and fits the bed perfectly. For the convertible dinette bed, I use twin sized sheets in a jersey stretch. The dinette bed isn’t as small as a twin, but it isn’t as big as a full sized bed either. Using jersey sheets provides a nice snug fit, and the stretch makes setting up the bed easy. Here’s the master bed all set up. I love to get my comforters and duvet covers from Ikea, both from home and the camper. They are cheap and well made, and I can choose different levels of warmth for my inserts. We find that a level 3 works really well for us. If we need more warmth, we pack extra blankets, but usually we don’t need them. I always take a few extra pillows for comfort, too — although, I don’t typically take as many pillows as you see in the picture. 😉 I have to compromise with Mr. TypeTwoFun sometimes… but we sleep like babies in here, and Mr. TypeTwoFun doesn’t often complain about that. In fact, after our 14-mile hike through the Redwoods last summer, everyone was happy to have that little extra bit of comfort to come home to. So there you have it! That’s how we set up our sleeping areas when we camp. How about your camper? 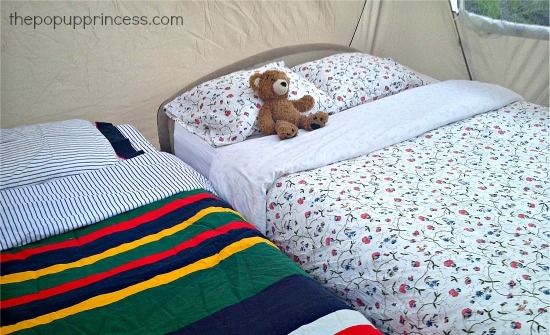 Have you added any little comforts that make sleeping outdoors easier? If you have, be sure to share them in the comments below! In looking on Ikea’s website, I don’t see the levels of the comforters… Only warmer or cooler. Can you help me find the level 3? Is that two twins I see on the other side of your pop up? We do this too! We use two twin air mattresses so when we roll over we don’t bug each other. 😂 They sit under the regular king mattress. We blow them up with a little pump and let the air out when we’re packing up. Love them!! DO you have heated mattresses? Just curious if that if the heat will come through the foam topper or not? I don’t want it to overheat. There are also heated mattress pads – again adds a little more cush to the sleeping surface! Larissa – you are a camping Goddess! We bought a popup three years ago and it was not in great shape. With all your suggestions, I can’t wait for this 3′ of snow to melt so I can get on with the renovations – especially the canvas scrubbing! We have heated mattresses, and our owners manual specifically states you CANNOT put anything like a pad on top of the mattress if you plan on using the heating option. We don’t bother plugging them in–we just use the foam pads. Good to know, Patricia. Thanks! Raw memory foam, latex, and polyurethane foam is extremely flammable (2 out of 3 of those are petroleum based). If you’re going to chance it and use a heating pad, make sure whatever topper you end up buying uses an FR (fire retardent) cover. Either a zippered cover or a tape edged cover but one that has either an FR lamination or quilting on the back. Otherwise, I wouldn’t recommend it. I own a company that makes toppers and mattresses for pop-ups so we get this question on a fairly regular basis. I will….We had our first short camping trip and loved it…The bed I was surprised that it was comfortable but I bet with a topper will be even better..We are about 80 percent done with our reno…Just a few little things left, we’ll get back on it at the beginning of the year and also looking forward to planning another trip….Oh by the way, we named her Betsy, lol..
Well, I made reservations for next month, so we want to finish a few other things… I saw the Topper at Walmart for 30.00 and an outdoor rug for 50.00… Next week I’ll go get those. ..I have to send you my pictures.. Try Kohl’s for memory foam mattress toppers, especially if you have a coupon and they are on sale. I got a King and a Queen for $75! Ok, I’ll check it out….Now I’m not sure…It did not look like yours with the holes. It just looked like rolled up foam in gray and white, like the 1.5 inch was divided in half, idk..
e got them for $99 each. We are never cold. My friend found the interlocking foam squares at a garage sale for $5 and it was enough to cover one of the beds. Now I need to get another set. I like your idea about the 2″ memory foam. We had purchased an inexpensive mattress from Ikea which works ok, but i think your idea is much better. Thanks! 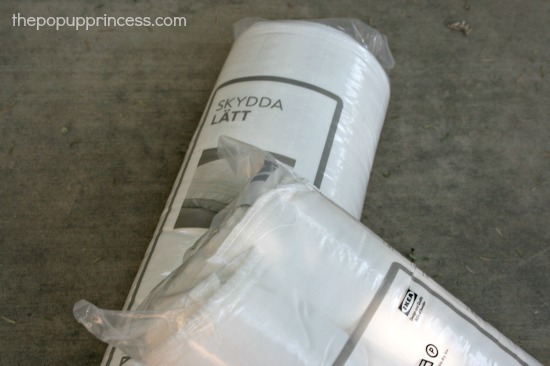 I also purchased the waterproof mattress covers you suggested. They work great! Do you have an air conditioner? We do not and I’m thinking of options for the summer? What have you heard about the stand up ones? I would love everyones’ input. We do not. We try not to camp anywhere where we might need one. One night in Zion last year, we wished for one a bit, but otherwise, we’ve been pretty happy. Free standing air cond? I believe it needs to be vented outside b/c of the heat it creates. We have a air cond but our pop up is new to us and we haven’t used it yet. 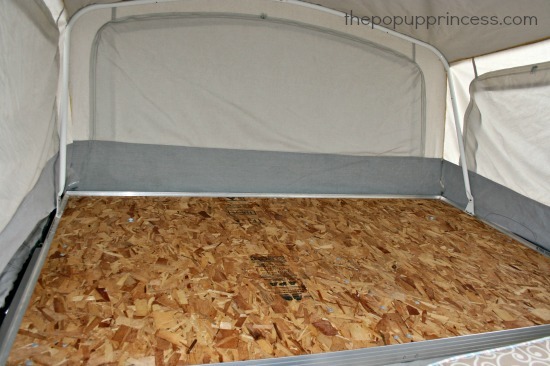 I’ve heard about PopUpGizmos.com, they make outside toppers for the bunk areas which have one side to insulate the inside of the bunks and the other side to reflect the hot sun away. No doubt, pop ups get hot when the weather is warm so depending on where you camp, you may need to spring for an air cond at some point. Our camper came with a A/C and heater. We use both often, but we live in Florida. In the summer we go north to get cooler, in the winter we stay at the Florida State Parks campgrounds which are extremely inexpensive with great facilities. They average $18-20 per night. Not bad! With full electric and water hook ups. What size fitted sheet do you use on the couch bed, do you have one of those next to your table bed? I got my bedding and accent pillows from ikea too! Have you braved taking the mattress cover off and washing it? I’m afraid I couldn’t get it back in! We don’t have a couch in our camper, Jennifer. We have the long storage cabinet instead. Have you tried a twin sheet in jersey stretch? It works really well on our dinette bed. The stretch gives it a nice clean fit. What do you do with the foam topper for your dinette when you are not using it as a bed? We’re old-time campers, but brand new to pop up camping. 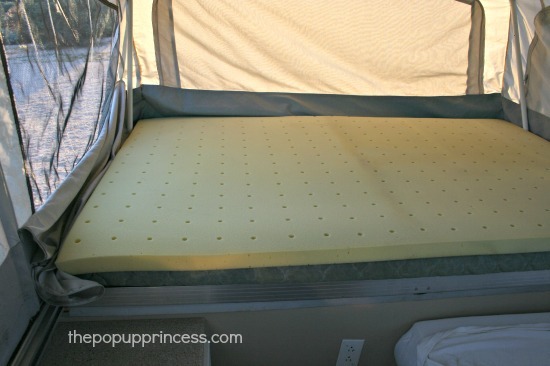 I love the idea of foam mattress toppers, especially for the makeshift beds from the bench cushions. My question is, where do you store the mattress toppers during the daytime when the table/benches are in use? Our camper has 2 different tables that both transition into beds. And with 4 little ones, we’ll be tight on space. I love your beautiful bed. I am going to spruce ours up a bit! Thanks for the inspiration. 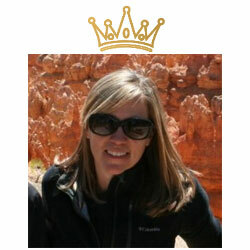 Welcome, Dreena! 🙂 Great idea! We’ve thought about heated mattress pads or blankets, but they’d only be a solution when we have hook-ups. Our coldest nights in the PUP were in Yellowstone–without electricity! Brrr! years ago – ice still on the lake and frost overhead where our breath froze on our Coleman Taos sunbrella fabric by morning. With 3 hot water bottles around us in the bed, I was so cozy I didn’t want to get up in the morning until my husband tempted me with a mug of hot tea. When I carried my hot water bottle to the unheated ladies room and poured the contents into the sink, the steam rose up, to the envy of others who had to use just cold tap water. We have had our Taos for almost 20 years. As there are just the two of us, I put both full mattresses on the same bed and use regular house bedding, complete with down duvet, wool blankets or cotton quilt, depending on the weather. We are Canadians and have camped in Northern Ontario, Newfoundland, BC. and all of our other provinces. We enjoyed camping in Big Bend Texas, Florida, Maine and Northern California among other American destinations. It is a wonderful way to really enjoy the natural world in our great countries. I do enjoy a bit of comfort too, especially in our senior years. Glad so many young families are experiencing these adventures too! We added the floor mats like you’d use in a garage to our beds for insulation from the outside air in addition to adding more padding to our mattresses. We also have added 1.5 inch memory foam to each bed. The camper closes up quite nicely even with these additions. Good to know, Lauren. I’ve heard about using the anti-fatigue mats under the beds. Do they make a big difference? I used the mats on the bottom, followed by a layer of memory foam, followed by a tent mattress topped by another memory foam. It is really comfey. We tend to camp in dryer climates, so I can’t really answer definitively, as we’ve never had an issue. I think you are thinking of condensation, though–when the temperature inside the tent is warmer than outside. You’ll sometimes have some condensation on the inside of the PUP. I’ve heard if you leave a window unzipped a bit, it helps with that. For dew, though, it shouldn’t be a problem if your canvas is properly waterproofed. Our canvas sheds water beautifully. We camped in Yellowstone in a torrential downpour and stayed warm and dry. We are from northwestern Wisconsin and frequently camp in cold (below 30 degrees) night time temperatures, waking up with a lot of dew and/or frost. We do find our pillows damp when they have been pressed up against the fabric through the night. When this happens we make sure to hang out our pillow cases and pillows to dry out during the day before heading back to bed the next night. The heavier the frost, the more my pillow tends to be damp. It isn’t too big of a problem, but something to watch for and not be surprised by when you are ready to snuggle in for the night. For moisture on canvas we always run a very small (electric can opener size) dehumidifier and we are always how shocked we are at the water we put out of it. It keeps our pop up very dry inside. Damp did works too. I had this problem too. I found that running a small electric heater with a fan works like a charm. Mine went from almost drippy wet to bone dry. I’ve heard thar solar blankets on the outside does the trick too. Having said that, even with waterproofing, if you place anything close to the canvas, you’ll have issues with water seeping through the fibers. If possible, keep bedding and mattresses as far away from the canvas as you can. I know… it’s tough. 🙁 Any chance you could make the dinette area into a comfy spot to watch TV, Jessica? I was actually wondering how everyone keeps the condensation ouy of their pop ups? We have a 99 Coleman Westlake Pop Up. We have an air conditioning/heater but we don’t use it. The camper is waterproofed although we put a tarp over the bunkend on the outside but when we come back from fishing at night the bed is still a little damp. We’ve tired having all the windows closed but that seems to make iit worse. .
You will want to unzip the windows a little bit to help curb condensation. Sometimes, if you are in a really humid or cold environment, you’ll still have that slightly damp feeling, but venting the camper will definitely help. We just got a pop up late this summer. On our only short trip of the season, we had condensation inside the ends. I thought it was from my CPAP but my 3 girls sleeping in the king at the other end also had it. One of them dreamed of being in a shower and tapped the roof, sending a shower on herself and sisters :). We just wiped it down with a towel in the morning. I finally came to spend more time on your fantastic website- I “know you” from the Popup Portal. I am so jealous of these fabulous makeovers! I just wanted to add that Overstock.com seems like a good place for memory foam too. I bought a 2″ there. I have a question for any of the folks that have heated mattress pads…I assume you use them over the memory foam topper, does it reduce the comfort level? I just got a new to me pup in December and bought a lot of new stuff- bedding, etc…I don’t know that I’m brave or talented enough to paint and redo the floors! I’m afraid it would come out terrible! I used to tuck the bedding in when kneeling on bed, but as one gets the can be a pain, so I figured out a much better work smarter not harder way! I lay all the bedding on the mattress from a standing position in the camper, then I go out side& tuck everything. If it’s cool at night I place pool noodles around the edges to keep cold out. Then I secure the canvas to the underside& done! Easy, warmer & cozy! Hi, I use crib bumpers from the goodwill and put them around the edge of our pop outs to keep the cold air out. The ties fit perfectly at the correct corner poles! Good idea, Karen! I like it! It seems like I have small gaps around where the canvas attaches to the bed platform letting in hot/cold air. Any suggestions? Love the site! Question: do you use the pool noodles to keep pillows from sliding off bed into the canopy? For whatever reason seems our pillows are on the bed at night and then only 1″ on the bed in the morning. We’ve pushed the pillows into the windows lol. What do you use to stop that? -foam interlocking anti fatigue or playroom mats on the bottom. We actually recycled mats our kids had in the play room when they were toddlers. I cut them down to size to fit the ply wood under the mattresses using heavy duty scissors. The foam really insulates the bed to keep the cold from seeping up through to you. – next is the camper mattress. These are the original mattresses that came with our camper when we bought it used a few years ago. The camper is a 1991, so it is probably safe to assume they are the originals. – king size waterproof mattress pad to protect everything. -We use a king size fitted sheet and we have a few different ones depending on what weather we are expecting. Cotton percale for the warmer weather and warmer nights (above 60 degrees). Flannel sheets for when the weather is going to be a little cool at night (30-60 degrees or so), and fleece sheets for below 30 at night. We use a flat sheet of the matching material based on the weather. You don’t have to spend a ton of $ on sheets either! Scope out your local thrift stores and you can pick up mismatched sheets cheap. -Next is the cotton waffle weave blanket. These make a huge difference in warmth level!! They hold heat in really well. This was another thrift store steal. – Next I use a fleece blanket when we are expecting the temperatures to be below 45 degrees or so. -Finally on top is a queen down comforter inside an Ikea Duvet cover. All of our beds are made before we leave home on our trip and the beds stay made until we get back home and strip beds to wash them. The clean bedding is all stored in those vacuum bags in a tote on the camping shelf in the garage until we are getting ready for the next trip. I have always found it easier to make beds at home when I am getting everything else ready to go. It is just one less thing to mess with when we get to the cg and set up. Our beds in our pop up are actually very cozy and comfortable. We love our pup beds almost as much as our beds at home. There is nothing better than crawling into bed after a long day and snuggling in for the night. I hope this helps someone who camps in cooler weather or on those cold nights. I too make up my beds prior to the trip. We like to camp out at Hubby’s hunting land. We just pulled up on a hill and set up camp, no power needed. We don’t typically get snow here in Georgia but we get the cold rains instead. After getting caught several times setting up in the rain (in the dark); I learned to slip a simple fitted vinyl mattress cover over the beds/bedding to keep things from getting so wet. This has all been so helpful for me! Thank you so much! We are new to the pup world (just purchased a 2004 Tradewinds). We are using it for the first time this coming weekend, but then taking it across country this summer from Florida to Washington! I am very nervous about the dew factor when we close up the camper each day. As we are traveling each day to a new location, I am worried about wet bedding. Are my fears silly? I have only tent experience and I know what one person means by the wetness from the condensation outside the tent seeping into the outside. Do you just leave all bedding except pillows on the beds before closing them up? Any advice would be great! I already put two of the 2″ mattress toppers into my “cart” on Amazon! As far as memory foam toppers… We leave ours on all the time, but we have lots of clearance and our roof shuts just fine with them on. We also leave the sheets on between trips, but I have found that if I want to leave the curtains up, the comforters have to come off. The camper shuts so much better when we take the comforters off and place them it the empty spaces around the PUP. It also helps pad things we’ve packed and keep them from shifting around too much during travel. We deal with a lot of frost and dew on our canvas and packing up to move with moist canvas requires a bit of planning. We store our pillows in the various empty spaces around the camper and in the various cabinets. The rest of our bedding stays on the bunks when we close up. If your top can close with your bedding in place, leave it instead of messing around with unmaking and remaking beds. You are going to have enough to do with changing sites daily, one less step will make it that much easier. Keeping your bedding dry only requires you to use a cheap tarp over your beds as if it is a top blanket. I spread the tarp out over the bed making sure there is a good 5″ or more overhang on every side. Next, go outside of your pup and unhook your canvas from the bunks. Put the canvas edges up on top of the tarp so you have easy access around your bunk. Work your way around each bunk tucking the tarp in under your mattress just like you are tucking a blanket in. Repeat this process on the other bunk. It will only take a few extra minutes, but it will make sure you have dry beds every night. For the moisture in the canvas, just make sure you open it back up ASAP each time you put it away damp. Use the sun to help dry it out. Let me know if my explanation isn’t clear. Enjoy your trip! It sounds like you will see many amazing sites! When did you purchase your topper? There are reviews on Amazon that the manufacturer has changed in ’14 and that the quality went way down hill. Just trying to make the best decision. Thanks. I love what you did with your pop up camper. We just bought a 2005 Fleetwood and I became very excited when I saw the beautiful conversion you did to the interior. It surely is a very inviting and cozy looking accommodation. You don’t mention putting a mattress topper or cover on the dinette bed. Did you not put them on? where do you find the counter tops to replace the old ones and another question, you know the tape between the stitching on the canvas? mine is starting to crumble and i have a corner leaking in my camper. I have had the seams restitched but it didn’t help. the place i took it to didn’t have the tape to put between the stitching. what should i do? I love this site and comment thread! Thanks for all the great information. We just inherited a 2000 Santa Fe from my dad and are in the process of replacing leaking hoses and seals. I just purchased new bedding today. Memory foam toppers are next! I can’t wait to take our little pop up tent out! What a great site and very resourceful!! I was wondering where I could get some mattresses not only for our beds but our benches for the table? I have looked for the table cushions and can’t find any, well for cheap anyway. I saw some foam at walmart, but it isn’t that great. Where did u get sheets individually. I looked for them but only found sets. After reading here I wanted queen flat with king fitted but all are sets. I love your camper. Trying to get our ntu Utah ready for first trip. Jenny, Target sells them individually. Mine were actually from sheet sets I already owned, but I’ve looked at replacing them with ones from Target. Do you have a Target close by? Hello there. We too have just bought a new to us, 2001 Coleman Bayside. Was wondering, how did you clean or disinfect the original mattresses? Ours looks pretty good, but the thought of how old it is and what has possibly been spilled on it kind of bothers me! Ours is that green color like in your pictures. I have sprayed Lysol aerosol on them, vaccumed them and laid them out in the sun for a couple of days. Thoughts? Thanks. How do you have those beds laid out for the other side? Did you make 2 separate beds on the Queen side? My kids fight like crazy at bedtime sharing blankets and whatnot — I’m wondering if this might be a great solution! I did not, Abby. I have a full sized bed on the opposite side, so no room for that option. One of my readers did that exact thing, though. I posted her pictures on my Facebook page if you follow it… and if you don’t, go follow right now! 😉 But seriously, it’s a great place to share ideas. I post a lot of makeover pictures and tips there as well. I’d love to see you over there. We have had our pop-up since 2004 and have 2 king beds and a double dinette. We use air mattresses in our bunk ends with heated mattress pads, jersey or flannel sheets, sleeping bags and extra blankets when needed. The air mattresses allow for us to sleep comfortably, and then deflate and have plenty of room to close down our camper. When we first started sleeping on air mattresses in 2005 we had a set that zipped together to make a king mattress or could be stacked to make a tall twin. Over the years, those have begun leaking and been replaced with just 2 twins on each side. 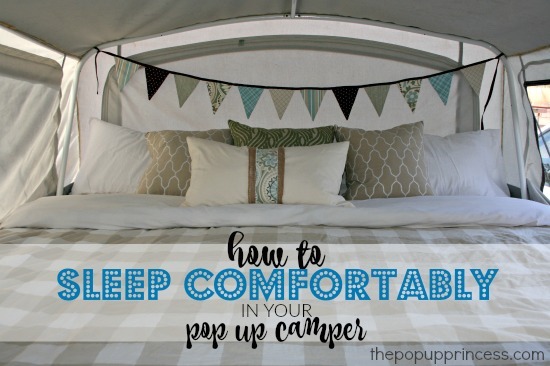 This works for us and makes sleeping in the camper almost as comfortable as sleeping at home. Hi Larissa! I just stumbled upon your site while researching mattresses for our pop up. I read all of the comments on this thread and they have given me some great ideas. I work for one of the largest foam manufacturers in the country and could have the odd sized mattress I need custom made but just because I work there doesn’t mean it would be cheap! I would rather use the mattresses that came in the camper along with other components to make them more comfortable. By the way, where do they come off calling those mattresses “high density foam”… are you kidding me? The comments also covered other issues like cheap ways to insulate the bunk ends. Many of the ideas are simple yet brilliant! So far this is the only thread I have read but I plan to look into your site further for more ideas along with pop up portal. I noticed, at least on this thread, that I am the only male contributor but I have the feeling I’m not the only man reading your site. I have a 2002 Coleman Niagara Elite I purchased two years ago. I am the third owner. The first two owners used it a total of eight times and stored it in heated and air conditioned garages… Its a cream puff. Just as soon as I got it my tow vehicle broke down which took much longer to fix than it should have. We were finally going to use the camper late last fall and when we arrived at the campground the attendant said the federal goverment was shutting down the next day and the campground would be closing… ya gotta love it! This past winter damaged some of the components on the camper and I am having it repaired next week. God willing and the creek don’t rise we are going camping soon! All I have ever done is tent camping but I have wanted a pop up most of my life. I enjoyed the tent camping but we are getting too old to sleep on the ground… it just isn’t fun anymore. Thanks again for the great ideas and happy camping! Awesome, Mark! Thanks for stopping by. If you come across a system that works for you, feel free to share it here! We do a lot of pop up camping in the Northern Adirondack Mountains in NY. I want to mention that yes, if you are in a colder climate area, there will be dew or condensation along the sides of the canvass overnight and anything in the crevices or stuffed along the sides will get wet. I read the pool noodle idea and that sounds great. Also, I see the picture of the two little beds together and am wondering if that is in your pop up or not. My two boys would love separate sleeping space like that. I’ve also seen splitting the larger side of the pop up with plastic storage bins so it makes two separate sleeping areas which I might try. Mattress toppers are super cheap at Black Friday sales. We got a nice king sized one for $29 at WalMart. 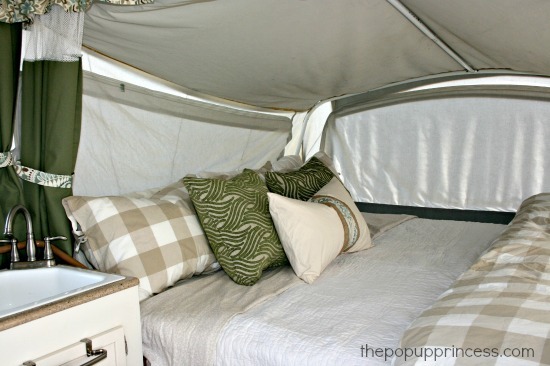 Since we are buying and renovating a pop up for our next summer vacation I will be sure to snag several for our beds! Thanks for all the tips! I haven’t seen any comment about this, but the newer more modern fabrics are pretty water resistant to rain if all the edges are properly secured. An old campers trick for sealing seams is just to rub a plain white candle on the seams. The modern fabrics caution against using a spray on sealer on these seams. I just recently purchased a 1992 Coleman Cedar. So a pretty basic pop up but it has running water, electricity and I just need to add a fridge. So I just used the tissue box idea posted here and it worked wonderfully. I have plenty of room for a mattress topper and bedding. This site is great. Thank you for having all of this information out there for newbies like me. We just bought our tent trailer and will be taking our first trip next month. I too prefer to sleep comfy and was wondering if you keep the beds made (sheets and blankets) when you store the trailer between trips? I love your site and am inspired to redecorate our Trailmanor hard sided pop up, I am wondering about the mattress. Ours is a foam mattress with an upholstered covering. I was going to remove the upholstered cover as I am making new covers for the dinette and not planning on new covers for the mattress, instead planning to decorate with bedding. But I now realize that the upholstered covers have a vinyl type bottom and cloth top. I’m wondering if that vinyl bottom serves as a moistur barrier that I need between the camper flooring/wall surface and the foam mattress? Can you advise? Is your mattress covered with anything on the bottom? Is it foam or other material? Thanks so much! We left the original covers on our mattresses and just put toppers and cute bedding on top. Is that an option for you? Last summer we bought new memory foam for both bunkends in our 1993 coleman cedar. The original mattresses and covers had seen better days! I had hoped to repair the one cover but that turned into a mess so we ditched them both. I found a really nice duvet cover from Ikea (got 2, one for each bunkend) for less than $10. We put the new foam mattress in a zippered cover, then into the duvet cover. We also bought the interlocking foam mats for underneath it all. We love sleeping on our “new” beds now. It is so much more comfortable than the air mattress, and a lot easier to make! Love your site! Learning lots and dreaming big for my ’94 Coleman Americana. I love the idea of the anti-fatigue tiles on the bunk ends. I too can feel that bunk end! Did you just interlock them together or did you glue them down? I have already gotten the cushions re-done and am going to paint and add a floating floor. My current project has been simplifying my screen room and awning set up. The Velcro does not hold up well and is not strong enough. So I went exploring on the internet! Couldn’t find any ideas, except ran across boat covers with snaps! Why not? I hunted down a local boat shop and they sent me to a great awning/boat cover maker and he hooked me up with instruction and snaps! Easy to do and now my screen room will stay up and will be easier to attach! Thank you for all your ideas and info! Great idea with the screen room, Lenora! I like it. Our tent-trailer beds has seen better days and I’m seriously thinking about ditching the mattresses and changing them for new ones. Did you, at some point change them or are those the original ones under? We’ve added an extra mattress once, on top of the actual bed and it was horrible. We both woke up in the middle of the night feeling that it was just as thin with or without it. This summer, I’m in search for THE solution and it might begin with getting rid of the old. Thanks. 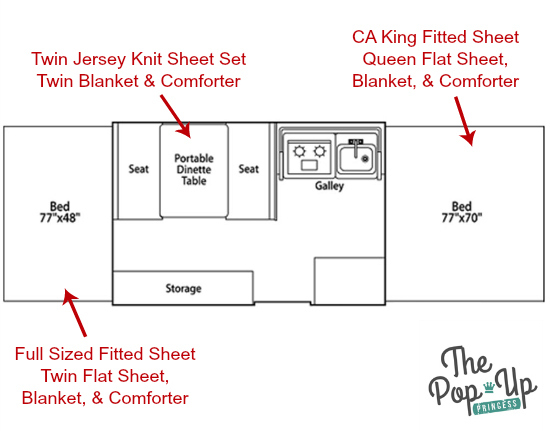 Hey I have a pop up with 2 kings and was wondering if you use a queen duvet or a king? We are getting ready to head out on our 1st camper trip later this month. I was wondering if the extra weight of the memory foam mattress has ever been an issue. We have a very nice foam topper we are no longer using at home and would love to move it to the camper, but it does seem pretty heavy. Thanks for the great ideas, especially on making the beds comfortable. We just purchased our pup so I needed to know how to make it comfortable. I have psoriatic arthritis and I need it to be as comfortable as possible and will be taking a pregnant daughter and 3 yr old grandson with us camping. I can hardly wait to get our camper all ready for the road! I am learning so much from you. Just starting on a 1983 Starcraft Galaxy and was trying to figure out how to cover the mattress, as they have the vinyl back as do the bottom cushions. Don’t know if I should completely take off the original covers or cover over them. The vinyl may be a problem, any suggestions? Also I see a green cover on your mattress, is this a mattress cover. I was just think you using sheets to cover my mattress, but like the looks of yours better. Thanks for any help. Thanks for the info. I wasn’t sure if I should scrap the mattress and cushion covers and make new ones or try and cover the old ones with the vinyl on them. They are ugly brown and orange upholstery , didn’t know if I needed the vinyl. I will try and clean them and read how to clean the foam. Would like to know where you purchased the mattress cover. What do you mean by solar bunk end covers? What are those and what are they used for? We just finished our first trip with a 2002 pop up. It was stored outside in western Washington, so pretty musty. Used a lot of cleaner and febreeze, but with good mattress pads didn’t notice odor. We found all too tight to add pads or even close with bedding. On trial run the beds were really hard. So.. I took the four Thermarests we have had for tent camping for 20 years and stuck them under the end beds. With valves closed the lid closed great. Way more comfy and didn’t have to buy anything. Life has handed my husband and I the chance to become (temporarily) vagabonds! We are cleaning house, putting everything in storage and hitting the road. We decided a pop up camper would be a great way to travel with our dog and no permanent home to come back to. (see what you can do when the kids are all grown) Yesterday we purchased a 1997 Rockwood Premier camper. It was taken care of ridiculously well but we still need to do some cleaning and personalization before we embark on our excursion. I am so excited to have found your website filled with lots of insightful information, DIY’s and things you have learned along the way (does the learning ever end? ha). Now I’m just wondering who on earth designs and decorates these little treasure to begin with? I realize not all women will ever agree on design and style (which is a great thing) but man my dinette cushions are burning my eyes…ha. I can’t sew, nor do I have any desire to try, so my hubs will have to carry that torch, but in the mean time can you tell me if you have any suggestions for possible slip covers. Of course we are keeping the budget belt tight and we have less than a month to prepare both our house rental and our camper. 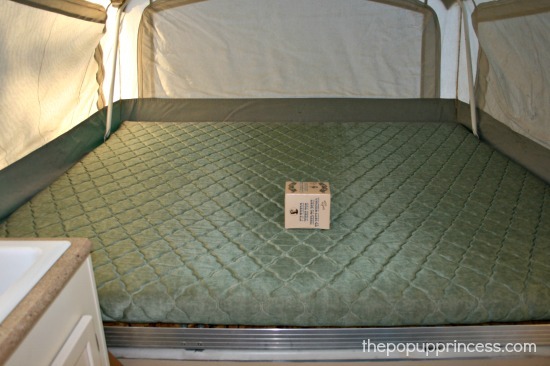 I have always used the original beds with memory foam toppers and then enclosed the original bed and the toppers in a waterproof, mold proof, bedbug proof zippered cover (a flexible material/vinyl). I put a white fitted sheet on from the bottom up that I leave on to protect everything while pushing in the pop up beds. I remove all other bedding when not camping. When I get to the campsite I add a fitted sheet to the top of the mattresses and other bedding. This way if anyone spills anything my investment is protected. Larissa my wife has a hard time sleeping with outside noise at the camp site and we are considering a Rockwood Roo with fold out beds. Like you said when Mom does not sleep well the trip can be very long! Any idea’s on sound deadening around the canopy with the fold put beds? Thanks for all the great tips and info! We keep a box of ear plugs in the camper for the noise. I have a hard time sleeping the first night when the sounds are all different, and I find ear plugs cut just enough noise so I sleep well. They also come in handy when snoring is an issue. Do you remember the brand of anti-fatigue mats you bought from Costco? I don’t remember the exact brand, Jordan. Our Costco carries them seasonally, though. You might check in the spring. 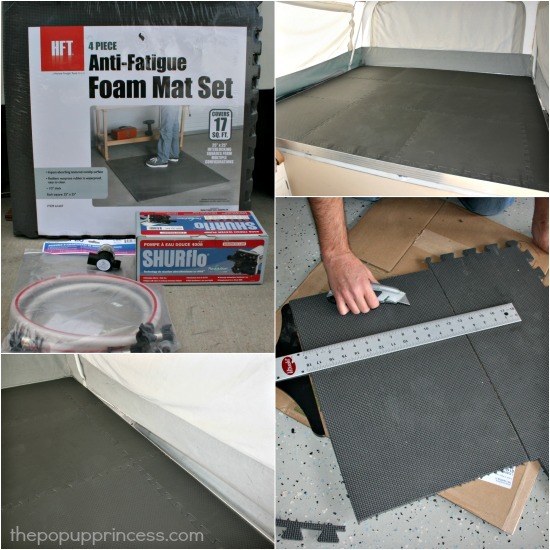 Have you or has anyone tried the anti- fatigue matts from Walmart? I live pretty rural and Walmart is all I have. Thank you so much for all of this information..!!!! So much helpful stuff.! Do you think rigid foam insulation would work? Underneath the mattress, that is! A 4×8 sheet of half-inch thick foam runs about 11 bucks. Maybe not too cushy, but (I would hope) warm. PUP, you are amazing. When I found your blog here, the first thing I saw was the king size pop out bed and the matching bed linens, pillows and adorable flags…AND the fact that you have the head of the bed facing the front (tongue)!!! WHY haven’t I thought of this??! (instead of me having to crawl over my husband to go to the bathroom at night ). We may be camping but NOTHING should ever get in the way of our pop up feeling like home:) It’s one of my most favorite things to do: setting up the inside of our trailer once the basics are up and running. I’ll be looking for all your posts. Thanks again for such refreshing ideas! I have a 93 Coleman Seneca with the similar odd sized Queen/King bed on one side and a Full sized bed on the other, and the mattresses need to be burned/replaced. I found a 6 inch deep Queen sized memory foam mattress on Amazon, and I wondered if you thought that would fit in your/my/our camper. I love your post about how you made your trailer comfy for your family. We are first time PUP owners longtime campers. I loved your idea about the anti fatigue mats and will be using it. Did you adhere the mats at all or did you just place them under the mattresses? Sometimes, you just don’t have room to leave the toppers on the mattresses, Marykay. I wouldn’t force it, as you could damage your roof. Any chance you could find a place for them inside the PUP? We have a 2001 Coleman Santa Fe, that is recently new to us. We bought the same 2″ topper than you list in the original post, but found that we still sink to the plywood bottom. I just purchased the rubber mats to help a little, but I would like to replace our original mattress as well. I am looking into a 3″ poly foam mattress/furniture cushion (FoamTouch Upholstery Foam Cushion High Density 3″ Height x 70″ Width x 77″ Length Made in USA https://www.amazon.com/dp/B072FKFHK3/ref=cm_sw_r_cp_api_6jSCzbGM7E4AP). With the 3″ cushion, the 1/2″ mat and the 2″ topper, we would be at 5 1/2″, although it seems with even a little effort the 2″ topper compresses flat. Do you think this would be too tall (since you have the same camper)? When I did the earlier Kleenex box test the box was not crushed (one may have been slightly touched), so we have at least 4 1/2″. Thoughts? Seems like it would work especially since that 2″ compresses easily but I also don’t want to put too much stress on the ABS top latch points. It gets tricky, Eric. Ours will sometimes close easily, and sometimes, it takes all of us pushing down on the corners to get the dang thing to latch. It often depends on how well we folded the canvas, how cold the canvas is, etc. I always feel terribly guilty pushing down too hard on the roof, because I know it isn’t good on that ABS. Any chance you have room in the PUP to store the mattress toppers on the floor if you need to? Larissa – do you leave the toppers on the matress when the PUP is stored? I know you keep them on while traveling, obviously, but wondered about the off season. We have a terrible time with rodents getting in our pup and generally don’t leave anything in it long term…but the thought of storing two king sized toppers isn’t workin’ for me lol! Hi everyone. Just sitting in our NTU 2014 Viking classic popup having coffee (in my driveway) excited to go camping next weekend. I love the ideas on here and wanted to see if anyone had a solution to make those aluminum extruded rails at the edge of the beds easier on the legs. They make it uncomfortable gettin on and off the mattress. Also any way to cover the sharp edges of the one by the door. I’m afraid someone will get scratched or the canvas will get worn. Thanks! Excellent post, I’m glad that I stumbled upon it because I’ve been thinking about getting a new mattress. I’ll be sure to follow your suggestion by considering memory foam mattress. We just bought our camper and I’m sooo happy I found your site!!! I can’t wait to work on ours! ok- 2nd article of yours I stumbled upon… decided to look at the rest of this site and – just – WOW – I LOVE this site… it’s now on my bookmark bar! I can’t wait to use your tips and tricks on making our PUP more clean, comfortable, and last longer… rustic is good for log cabins, not for family camping in a PUP! I can say without a doubt this is the best PUP info sight out there! I’ve shared with my wife and she is really digging this site too, I have a feeling that you and she are a lot alike so this has really helped get her more excited and want to get into using our PUP more often! Thank you! Thanks so much for the great ideas! I inherited and lovingly restored (w.i.p.!) a 1985 skamper from my parents, and your foam tile idea worked GREAT! Question: Any cst-saving tips for mold/condensation control under the mattress. After only one night in New Hampshire early fall, we already noticed significant condensation. I found a great marine open cell liner, but it was $10 per foot and only 39” wide…. Any DIY ideas would be most appreciated! We just purchased our first pop-up yesterday from an individual. It needs some minor repairs. I ma loving your blog for ideas and how-tos. So, in this article you said you were starting to feel the “OSB”. What is that exactly? LOL.